Don't be surprised if your crew rushes the buffet table when you set out these Easy Party Meatballs. These Easy Party Meatballs are sweet and tangy. Mix meat, stuffing mix and water just until blended. Shape into 1-inch meatballs. Place in 13x9-inch baking dish sprayed with cooking spray. Bake 20 min. or until done (160ºF). Meanwhile, combine remaining ingredients. 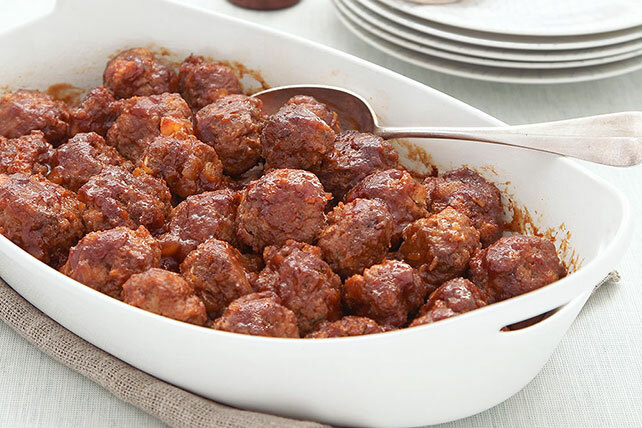 Pour barbecue sauce mixture over meatballs; stir to evenly coat meatballs. Bake 10 min. or until sauce is heated through. Prepare using KRAFT Hickory Smoke Barbecue Sauce or your favorite variety of KRAFT Barbecue Sauce. Prepare meatballs as directed, except omit the final baking step after covering the meatballs with the sauce. Cool, then refrigerate up to 24 hours. When ready to serve, bake the meatballs in 425ºF oven 20 min. or until meatballs and sauce are heated through.